PMI Rib roofing profile is manufactured from Pre-painted galvanized steel (PPGI)/Al-Zn alloy coated steel (Bare Galvalum) and color coated Al-Zn alloy coated steel (Color Coated Galvalum) with a cover width of 1010mm, overall width of 1050mm, pitch of 200mm and a crest height of 30mm with two stiffening ribs in between. PMI Rib roofing can be fixed on both roof and wall cladding and any slope and height as per the designer’s choice. 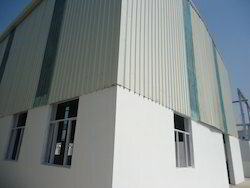 Metlex Hi Rib roof and wall cladding systems are constructed in the different constituting materials with the desired standard.Galvanized Steel and high-tensile cold rolled Metlex in conformity with AS-1397 standard coating including class. We bring forth for our clients an extensive assortment of high quality PPGI Roofing Sheet. Offered roofing sheet is checked in terms of quality before delivering at customer’s end. 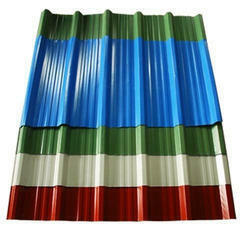 This roofing sheet is manufactured from the high quality material & modern techniques, as per international quality norms. 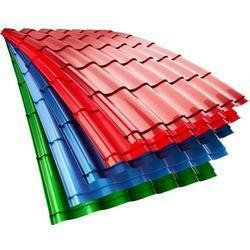 In addition, we provide this roofing sheet on several specifications for meeting the variegated demand of customers. 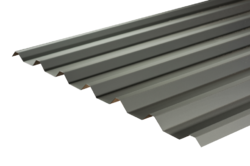 We hold expertise in offering a high quality range of Cladding Roofing Sheet. These products are inspected by our experts using finest quality material & leading techniques in accordance with the market standards. Offered products are provided in customized options as per the requirements of customers. Customers can avail these products from us after checking properly in a promised time frame. As an ace manufacturer, supplier, wholesaler, distributor and trader of Roofing Sheet, we have marked our name very strongly in the market. These products from our end come in many shapes and sizes, in both class B and class A rated fire codes. These are made available for public venues, such as hospitals, schools and churches, should be cut from melamine foam, which is class A fire approved. Industrial, recording, studio and residential treatments will typically target class B rated foams, made from open cell polyurethane foam. Under the expert supervision of our ingenious professionals, we are providing an astonishing gamut of Galvanized Roofing Sheets. These factory roofs are manufactured by our experts at our state-of- art manufacturing unit, utilizing superior quality basic material. Offered factory roofs are thoroughly tested by our quality experts at our end, in ahead of their final delivery so as to ensure its flawlessness. Patrons can avail these factory roofs at affordable prices. Under the expert supervision of our ingenious professionals, we are providing an astonishing gamut of Steel Decking Sheet. With the help of our state-of-the-art infrastructure unit, we are able to provide superlative quality Hi Rib Roofing Sheet. We manufacture this roofing by making use of best quality of material & modern techniques keeping in pace with industry norms. The roofing provided by us is available on different specifications as per the needs of customers. We provide this roofing in a given time frame at affordable price. Length Bespoke size, possible upto 12Mtr.